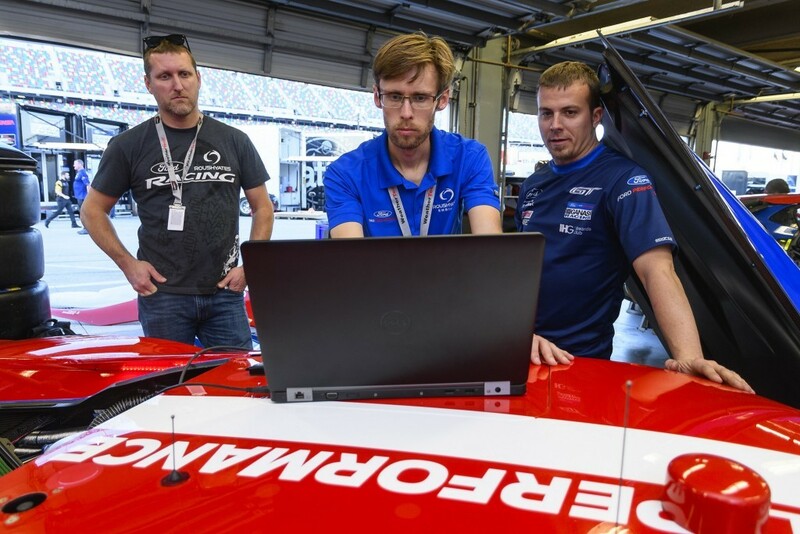 January 5th -8th, 2017: Ford Performance, Ford Chip Ganassi Racing and Roush Yates Engines took part in the ROAR before the ROLEX 24 at the Daytona International Speedway. 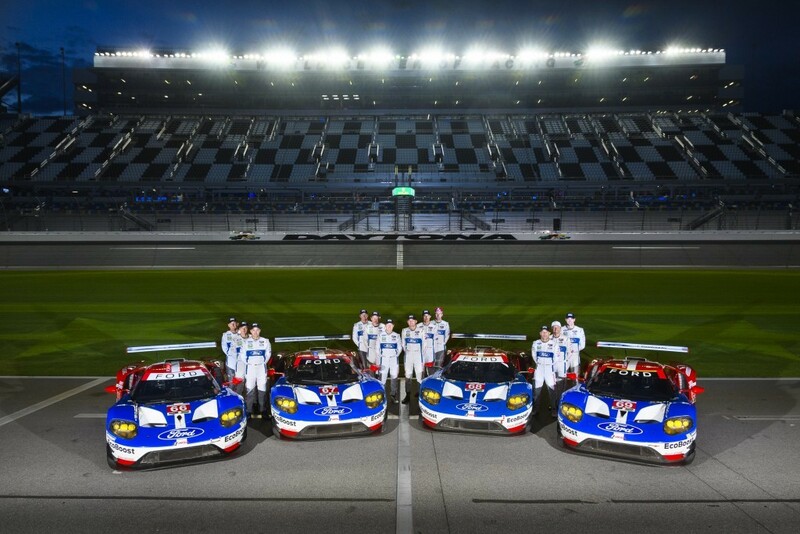 The teams and drivers are ready for the ROLEX 24 AT DAYTONA (January 28th, 2017). This will be the first IMSA WeatherTech Sportscar Championship race of the 2017 season. 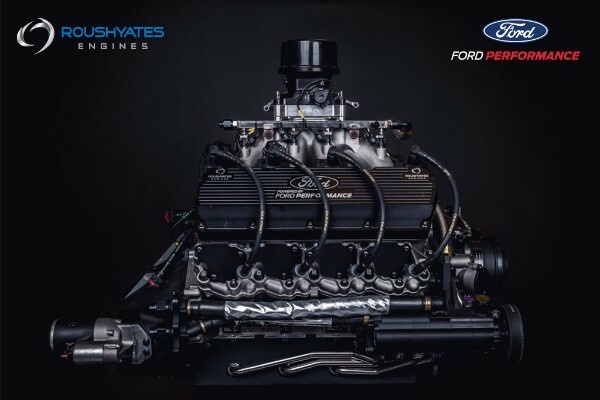 Roush Yates Engines will be powering four Ford Chip Ganassi Racing cars with the twin-turbo Ford EcoBoost V6. 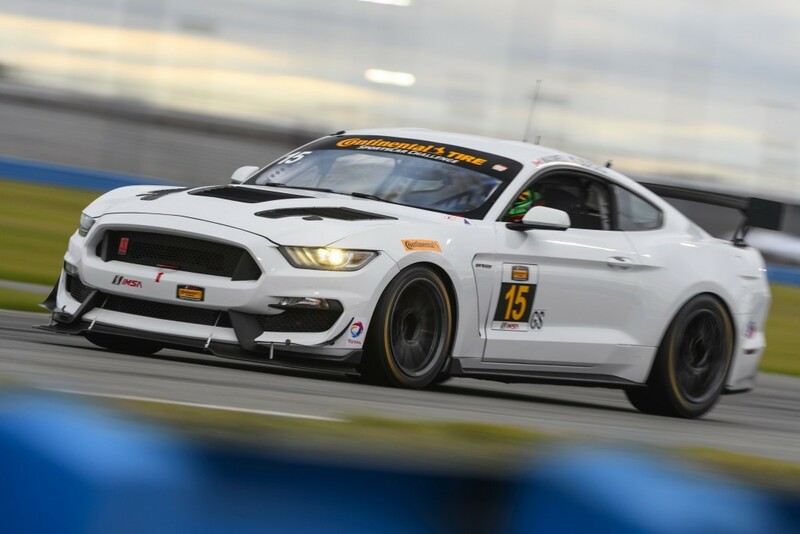 Ford also debuts the Mustang GT4 for the IMSA Continental Tire SportsCar Challenge. 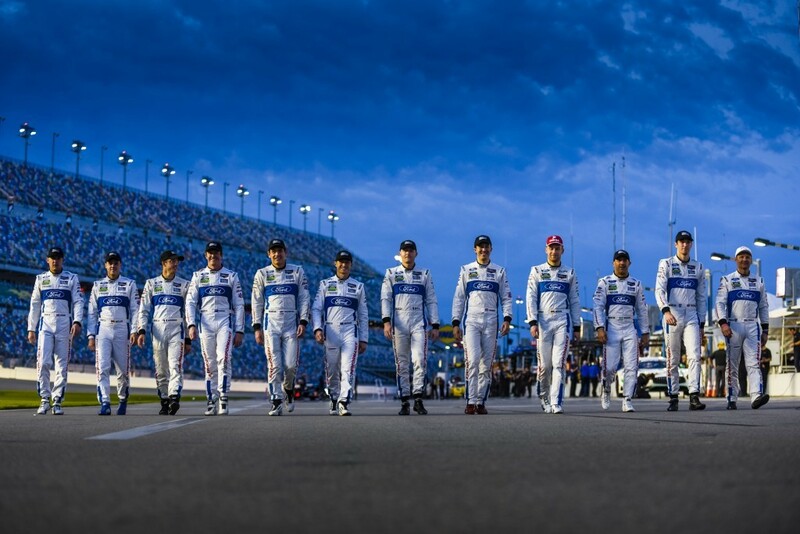 Mooresville, N.C., – The Crew, Drivers, Cars and Ford EcoBoost V6 engines are ready to take on the grueling 12 Hours of Sebring. The race is the second in both the IMSA WeatherTech SportsCar Championship season and Tequila Patrón North American Endurance Cup (TPNAEC). 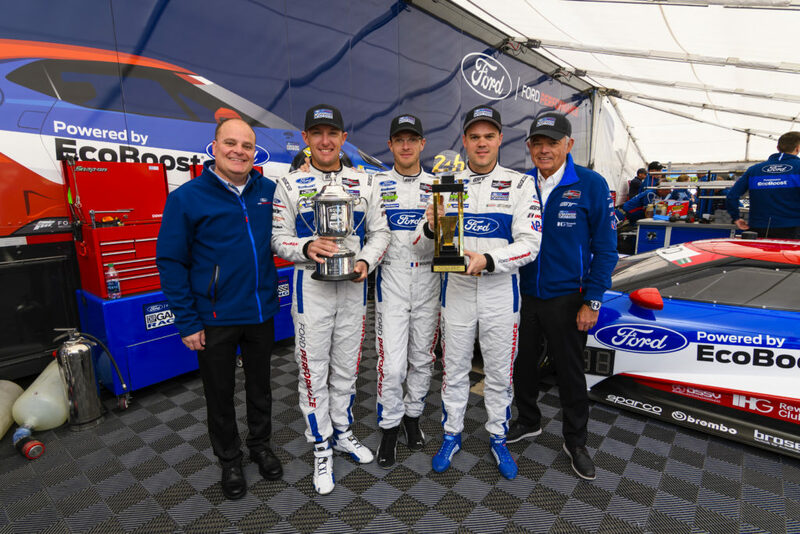 Ford and Ford Chip Ganassi Racing (FCGR) lead the IMSA WeatherTech manufacturers,’ team and driver points standings after the first round. They trail by two points in the TPNAEC standings, a stand-alone ranking that features North America’s most prestigious endurance races. 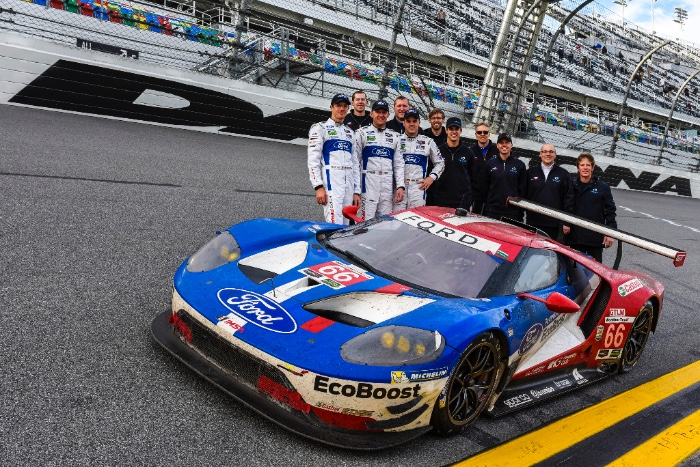 Ford Performance and the Ford Chip Ganassi Racing teams enter the race with momentum from winning the season-opener, the Rolex 24. What makes Sebring unique and so challenging is much of the circuit’s surface is the remains from the facility’s days as Hendricks Field, a World War II base used to train B-17 crews, known historically as America’s oldest road racing circuit. Three FCGR teams will be racing in Saturday’s event. The recent Rolex 24 At Daytona winners (GTLM) the No. 66 Joey Hand, Dirk Müller and Sébastien Bourdais; No. 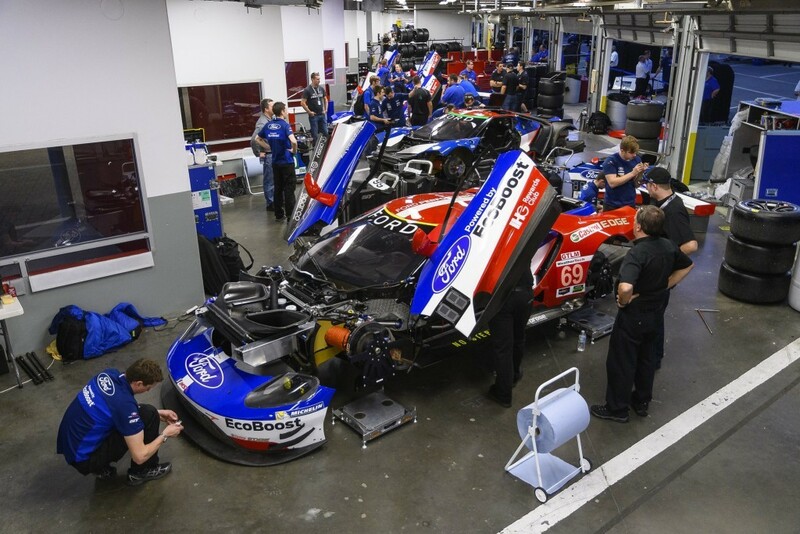 67 of Richard Westbrook, Ryan Briscoe and Scott Dixon; and from the sister FCGR – UK team the No. 68 of Stefan Mücke, Olivier Pla and Billy Johnson. It was 50 year’s ago, when Mario Andretti and Bruce McLaren won Sebring in 1967, in the original GT40. Will the Ford GT follow in these legendary foot steps? The race is the final stop on the quest to sweep three of the world’s most legendary endurance races within nine months, which would include the Rolex 24 at Daytona and the historic 50th Anniversary win in June 2016 at Le Mans in the 24 Hours of Le Mans. Original article written by Conde Nast Traveler and can be found at the following link: http://www.cntraveler.com/story/how-a-us-race-team-flies-2-cars-and-13-tons-of-equipment-to-france-for-le-mans. It’s 13 tons of equipment, not including the cars. One of the world’s most prestigious motor races hit the streets of Le Mans, a quiet French town two hours outside of Paris. The 24 Hours of Le Mans race is in its 85th year, and fans and race teams alike fly in from all over the globe to take part in this special piece of history. Teams flock to the legendary Circuit de la Sarthe to snag a podium spot, but at Le Mans, finishing at all is an accomplishment—hence the name. While the race itself is enough of a challenge, just getting there takes plenty of effort for most international teams. 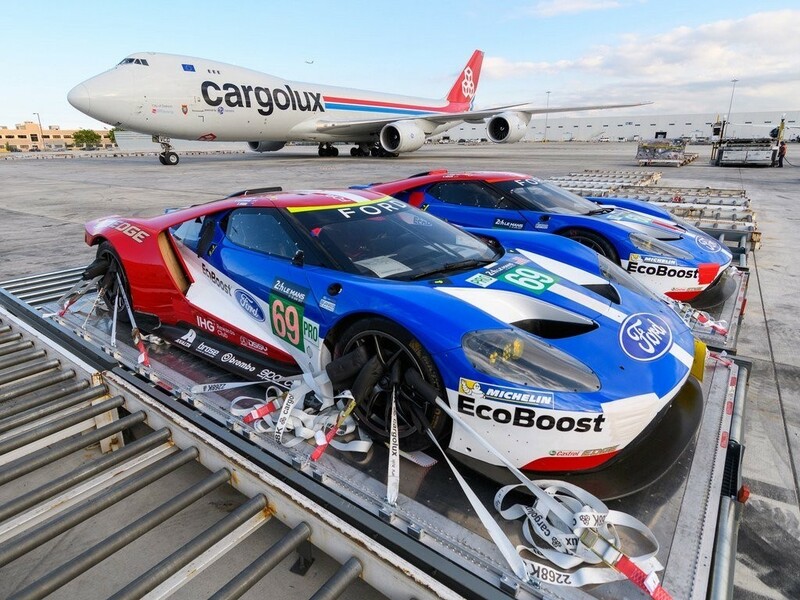 For example, in order to compete in Le Mans, the Ford Chip Ganassi Racing – US team has to travel across the ocean from its home base in the United States via air freight. Annually, the team clocks in about 300,000 miles of domestic travel, and 100,000 miles internationally. 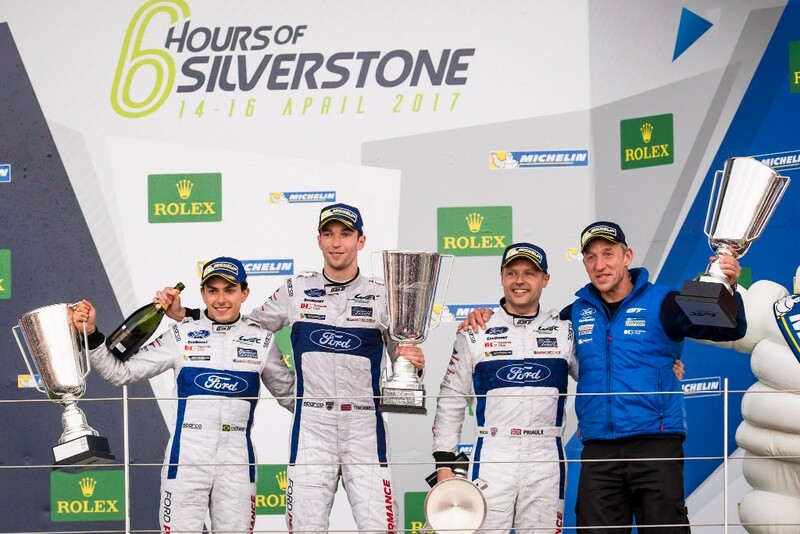 Preparation for this year’s race began immediately after last year’s 24 Hours of Le Mans, where the Ford team took home an overall victory in its LMGTE Pro series with the No. 68 Ford Chip Ganassi Racing Ford GT driven by Joey Hand, Dirk Muller and Sebastien Bourdais. After nearly a year of preparation, last month the CGR Team began shipping a couple of their Ford GT race cars overseas. 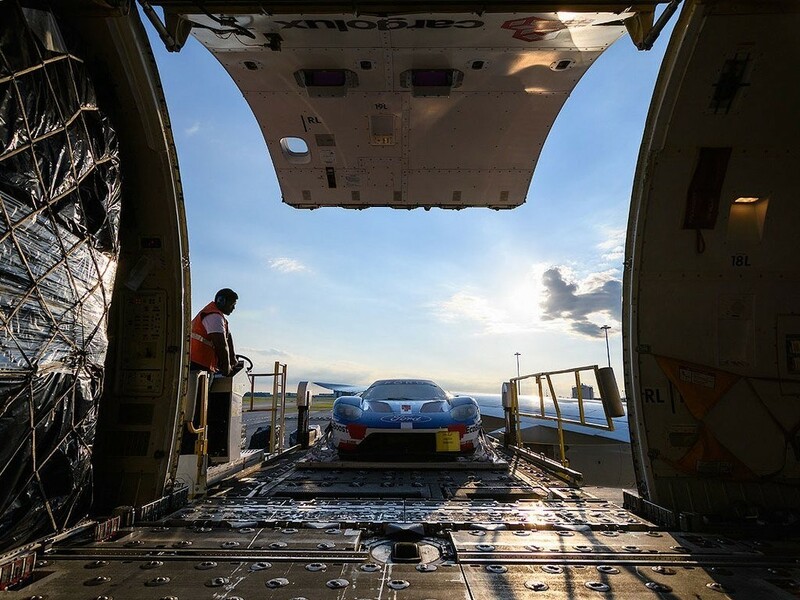 At Chicago O’Hare International Airport, two race cars were loaded onto a Boeing 747-8 freighter chartered by Cargolux, a company known for handling high-value, precious cargo. The cars then took an overnight flight to London’s Heathrow Airport, and eventually made the 7.5-hour journey to Le Mans inside a tractor trailer—fortunately, cars don’t really deal with jet lag. 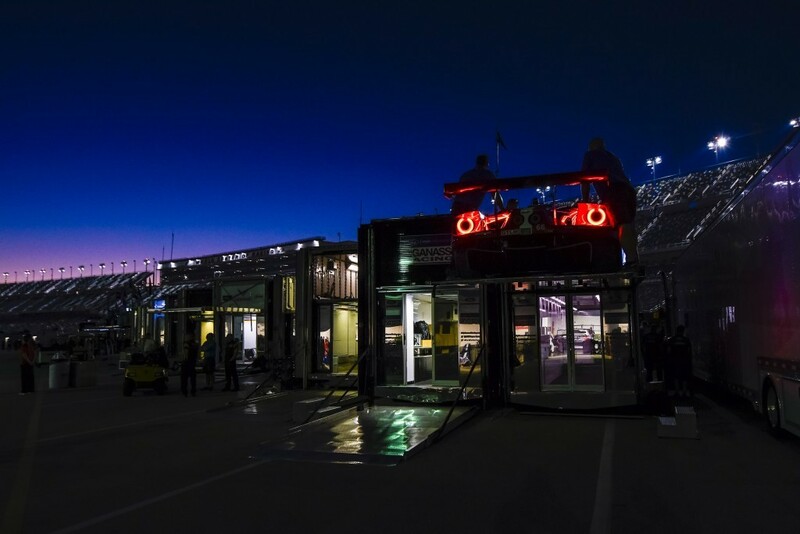 Since they’re facing both day and night time driving, race teams have to prepare for a variety of conditions. 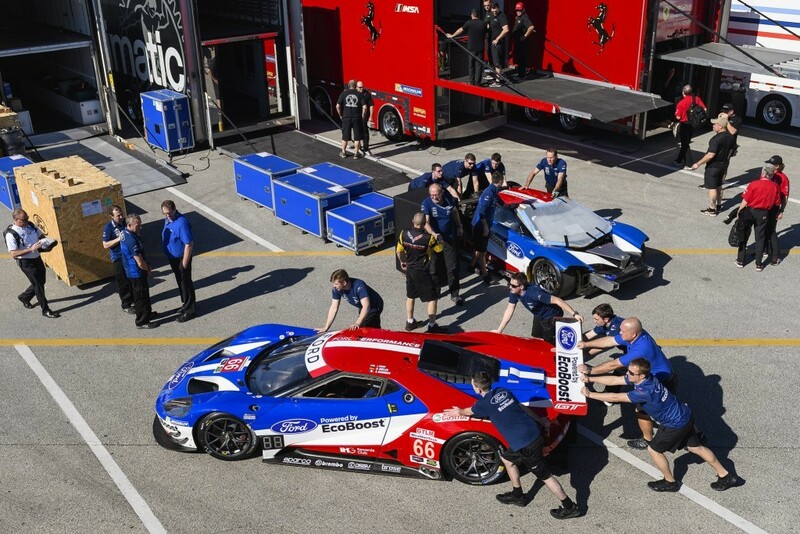 So, in addition to the two race cars, CGR Team had to load an extensive packing list that includes tools, 29 pieces of spare bodywork, four extra twin-turbo Ford EcoBoost V6 engines, 20 sets of rims (that’s a whopping 80 total), a custom built mobile fabrication unit—virtually acting as a moving machine shop—and all of the support equipment for the race cars. We did the math, and all of these extra supplies come to a total of about 13 tons of cargo, not including the weight of the two cars. When the race is finished, the CGR Team will pack up once again and ship everything back to Chicago via air freight. But there’s no vacation until next year’s race: Once the cars land back stateside, the team will have three days to rebuild them before they’re back on the road to finish out their jam-packed race calendar. Next race will be at Watkins Glen, July 1st – 2nd, 2017. 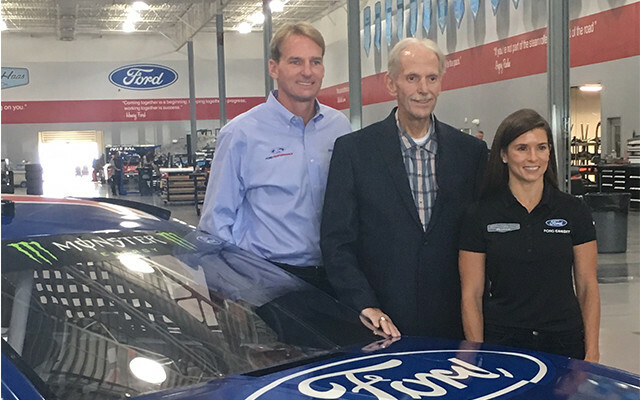 KANNAPOLIS, NC, August 14, 2017 – Stewart-Haas Racing will honor 2018 NASCAR Hall of Fame inductee Robert Yates with a throwback paint scheme on the No. 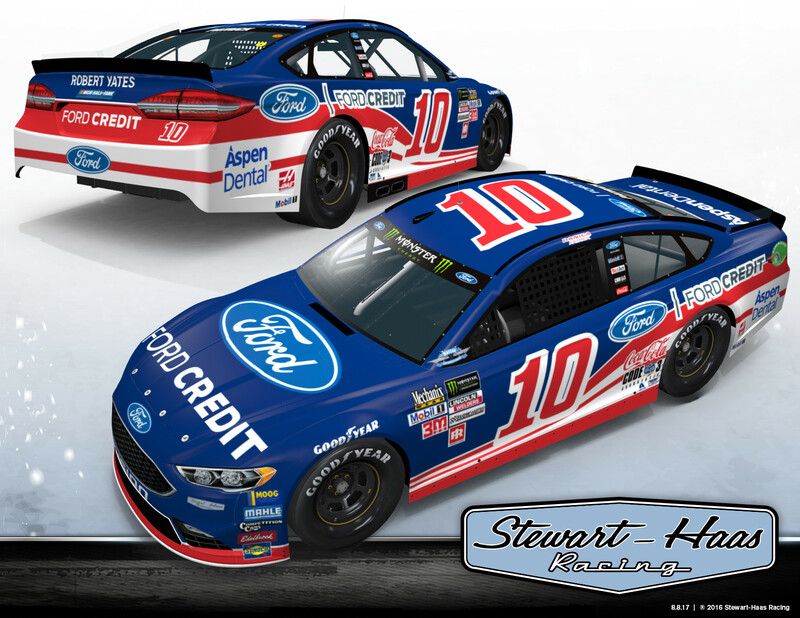 10 Ford Fusion Danica Patrick will race during the Southern 500 Monster Energy NASCAR Cup Series race Sept. 3 at Darlington (S.C.) Raceway. After working in the sport for more than two decades, Yates launched his own team, Robert Yates Racing (RYR), in the late 1980s. In 1996, RYR expanded to a two-car operation, fielding the No. 88 Quality Care/Ford Credit Ford with Dale Jarrett. The decision by Yates to add a second car to the stable resulted in Jarrett winning the 1999 championship in a paint scheme that Patrick’s No. 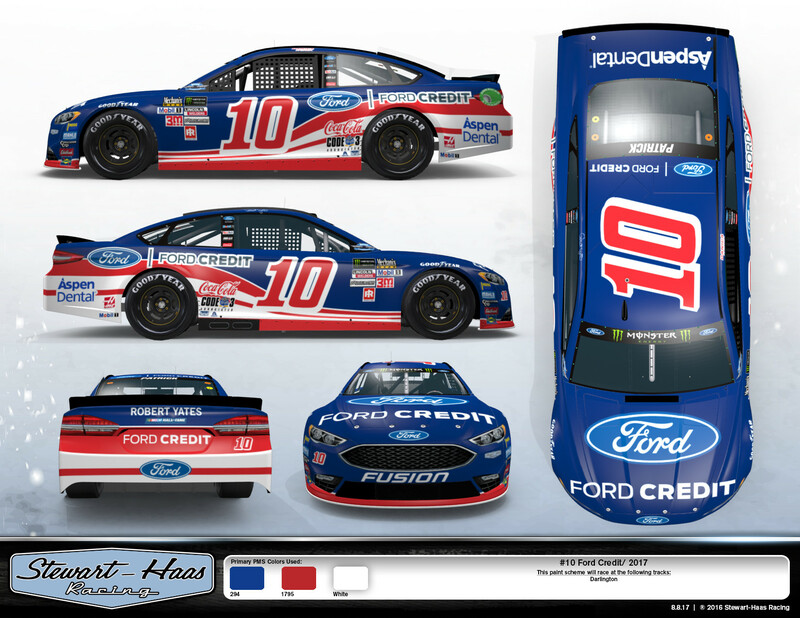 10 Ford Credit Ford Fusion will emulate at Darlington. 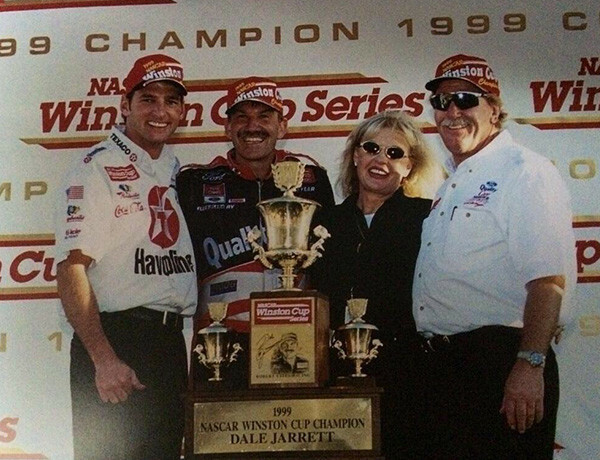 In addition to the championship Jarrett earned in 1999, RYR amassed an impressive 57 wins, including three in the Daytona 500. Ford Credit is the financial services arm of Ford Motor Company. The brand was first seen on a NASCAR racecar in 1994 when it sponsored Elton Sawyer in what is now the NASCAR Xfinity Series. The sponsorship was very successful, so much so that in 1996 it expanded into the NASCAR Cup Series, which allowed RYR to become a two-car team. Jarrett ran the No. 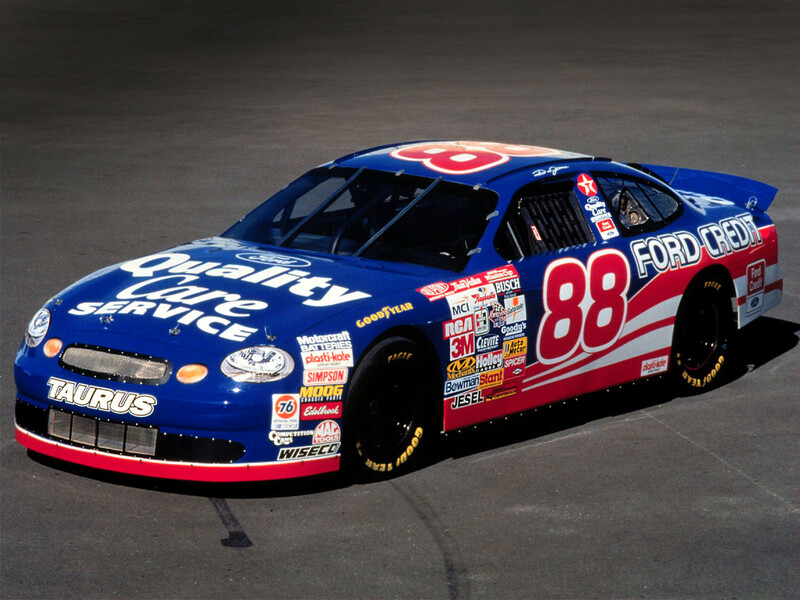 88 Quality Care/Ford Credit Ford paint scheme from 1996 through 2000, earning 20 wins, nine poles and leading more than 5,000 laps. That tally includes wins at Darlington in the 1997 and 1998 TranSouth Financial 400. The 1.366-mile Darlington track and its Labor Day race weekend host “The Official Throwback Weekend of NASCAR” when the industry honors the sport’s history. Last year, 36 Cup Series teams competed with throwback paint schemes in the Southern 500, the most in any single NASCAR event in the sport’s history. As the series returns to Darlington for the 68th Southern 500, the chance to honor Yates will be a special one for Billy Scott, crew chief for Patrick and the No. 10 Ford Credit Ford Fusion. 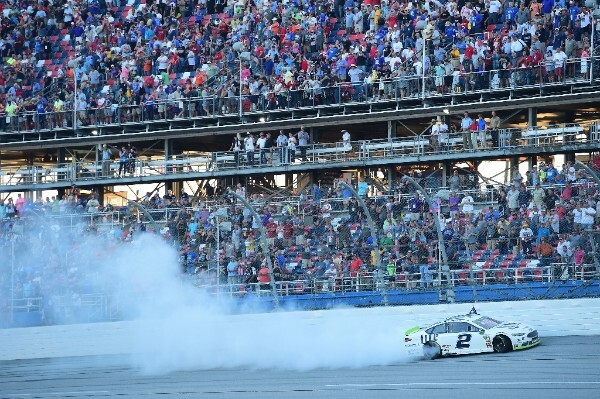 KESELOWSKI WINS AT TALLADEGA TO ADVANCE IN THE NASCAR PLAYOFFS! 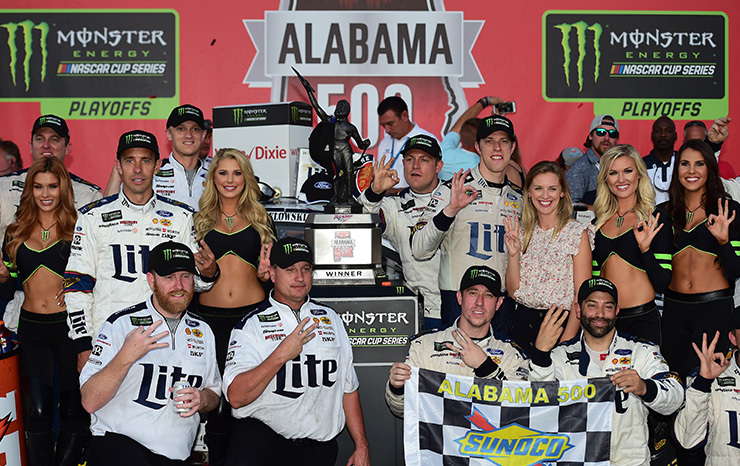 TALLADEGA, Ala., October 16, 2017 – In his 300th career start, Brad Keselowski won his fifth Talladega race and automatically advances to the Round of 8 in the Monster Energy NASCAR Cup SeriesPlayoffs. The No. 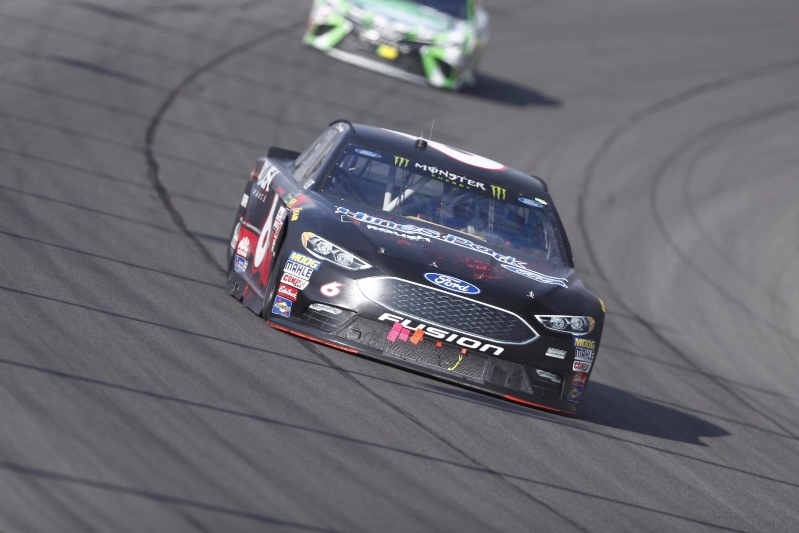 2 Team Penske Ford Fusion recorded the fourth restrictor-plate race win of the season, marking the first time in NASCAR history for Ford Performance and Roush Yates Engines to sweep four restrictor-plate races in one season. After 30 lead changes, 11 cautions and three red flags, it came down to a sprint to the finish. There were 14 cars left on the lead lap, as they took the white flag for the final lap. 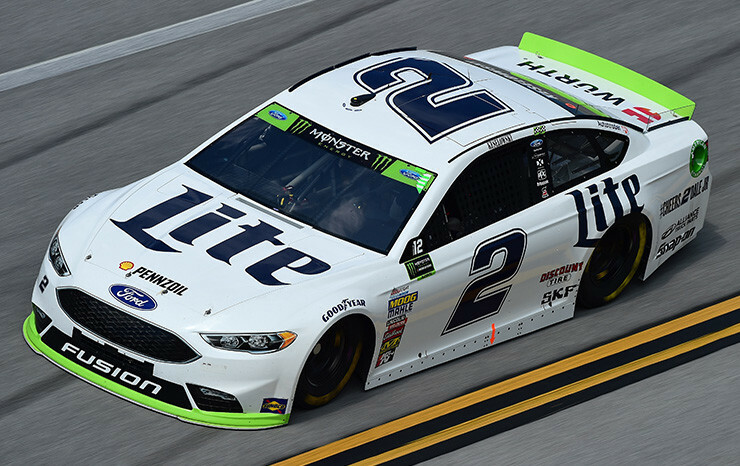 Keselowski was able to take the lead exiting the tri-oval for the last time, with a big push and block from teammate Logano, Keselowski was able to leverage the Roush Yates’ horsepower one final time to take the black-and-white checkered flag. 13 CHAMPIONSHIPS – 308 WINS – 277 POLES! 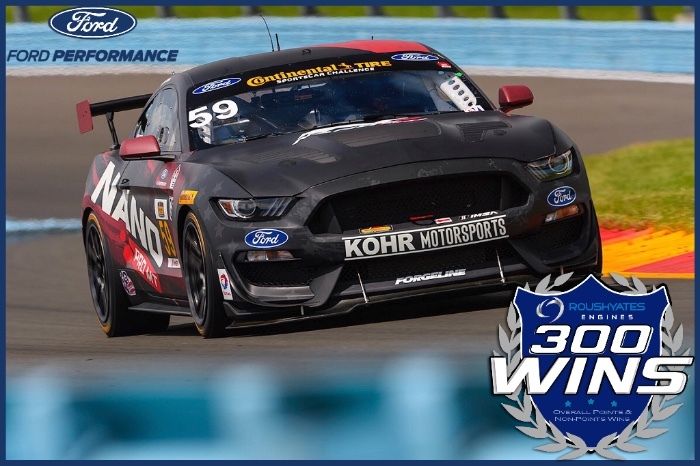 During the course of the 2017 season, the signature Ford FR9 EFI and FR9 Carb race engines powered Ford Performance teams to one championship, 22 overall wins and 22 pole positions across the Monster Energy NASCAR Cup Series, NASCAR Xfinity and Camping World Truck Series. 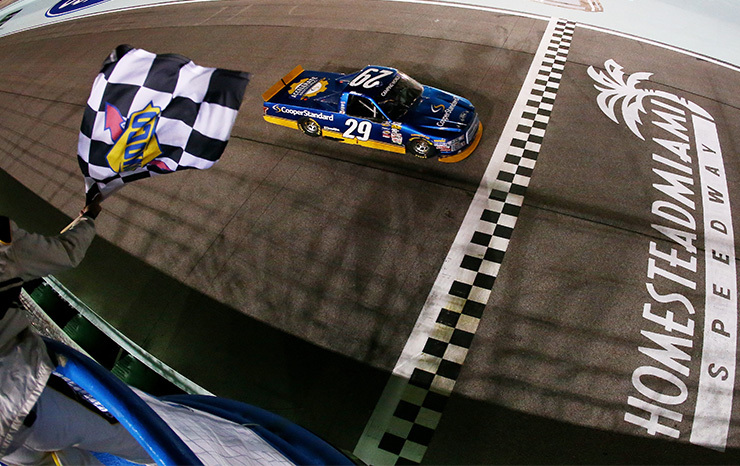 The first of these wins came at Daytona International Speedway. 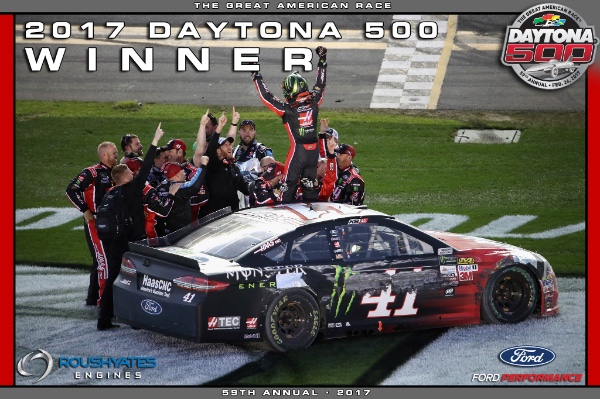 Kurt Busch recorded his first Monster Energy NASCAR Cup Series Daytona 500 win and first win for Stewart-Haas Racing (SHR) in partnership with Ford Performance. Kevin Harvick, No. 4 driver for SHR captured their first pole of the season in Atlanta, while the No. 2, Brad Keselowski from Team Penske won the race. 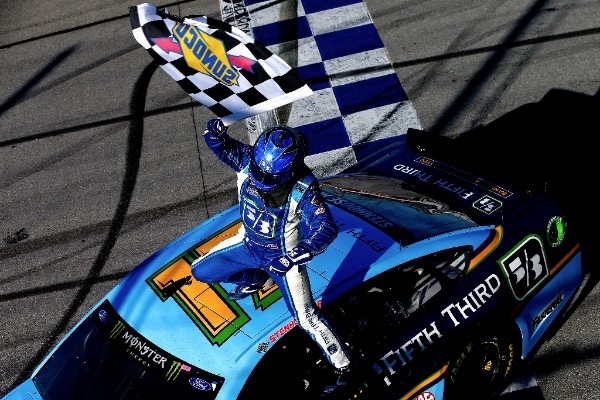 Ricky Stenhouse Jr. made history at Talladega Superspeedway winning his first MENCS career race while starting from the pole position for Roush Fenway Racing. 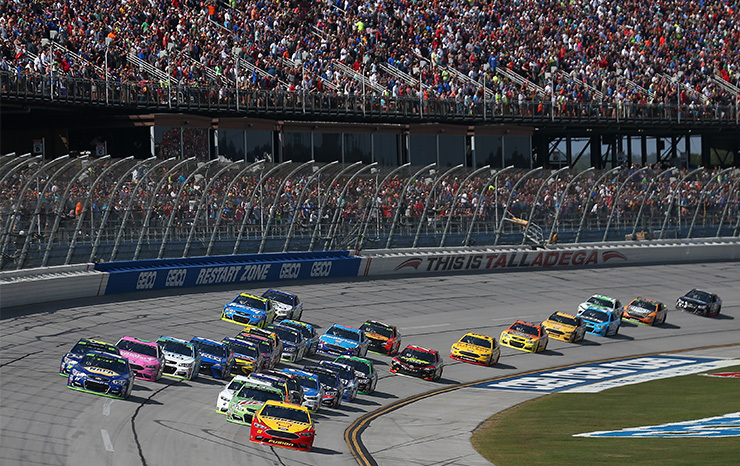 No manufacturer has dominated the restrictor-plate tracks of Daytona and Talladega in recent years more than Ford. Stenhouse Jr. and Keselowski made history, with Stenhouse Jr. winning the Daytona Coke Zero 400 and Keselowski going to victory lane in the Alabama 500, marking the first time for Ford and Roush Yates Engines to sweep the restrictor plate races in a signal NASCAR season. 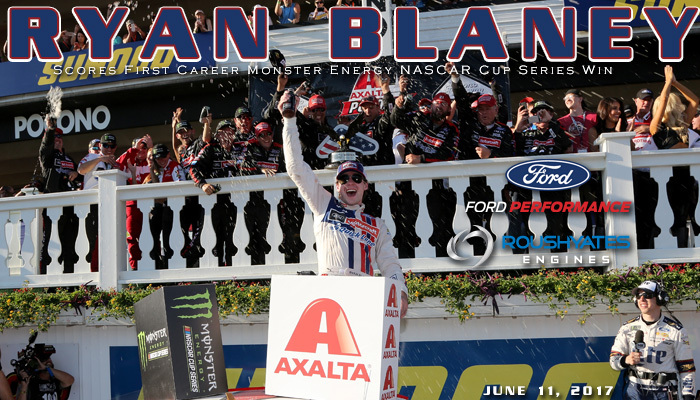 Ryan Blaney delivered the best season for Wood Brother’s Racing since 1995 by winning his first career Cup race at Pocono and tallying two poles for the season. 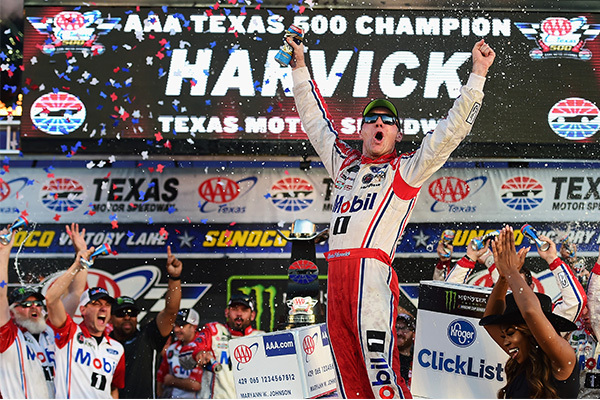 Harvick also recorded his first win under the Ford brand at Sonoma and went onto record a total four poles and two wins, including the AAA Texas 500 in the 2017 season. Kurt Busch in the No. 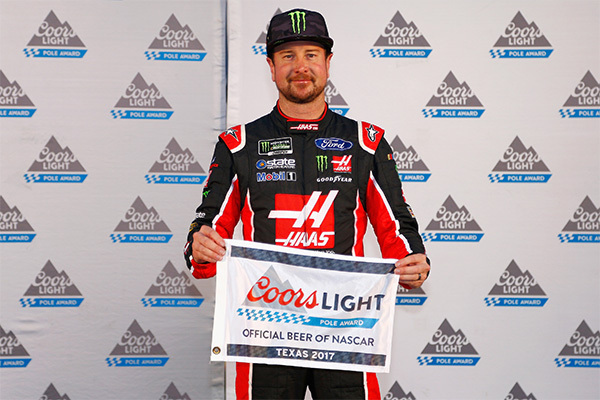 41 Stewart-Haas Racing Ford Fusion captured the 280th overall pole for Roush Yates Engines at Texas Motor Speedway. 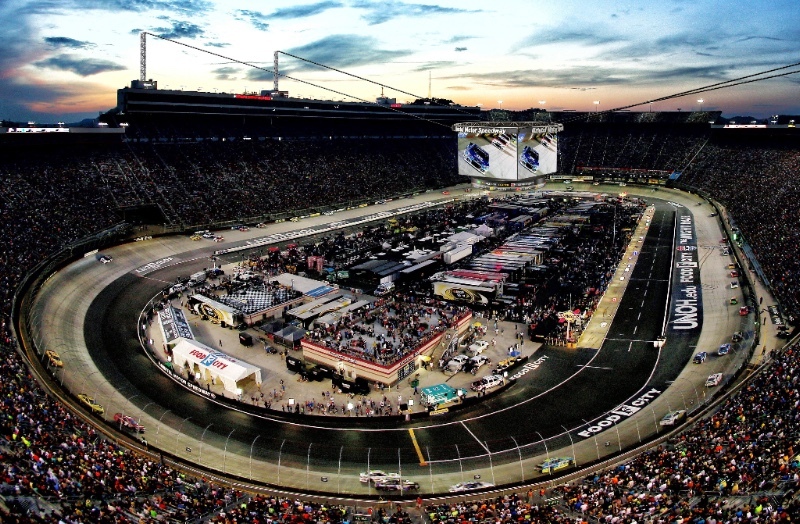 Busch recorded the fastest lap in MENCS history on a 1.5-mile track at 26.877 seconds, running 200.915 mph. 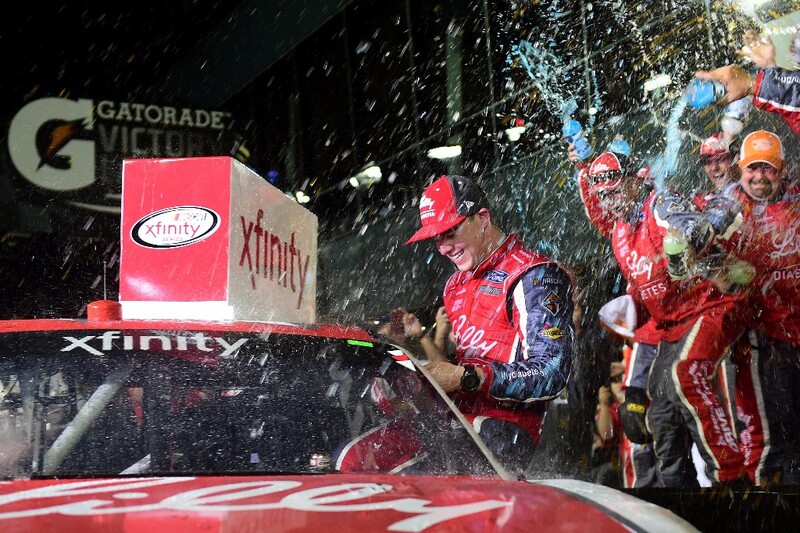 The NASCAR Xfinity season started with Ryan Reed from Roush Fenway Racing winning the PowerShares QQQ 300 at Daytona International Speedway. 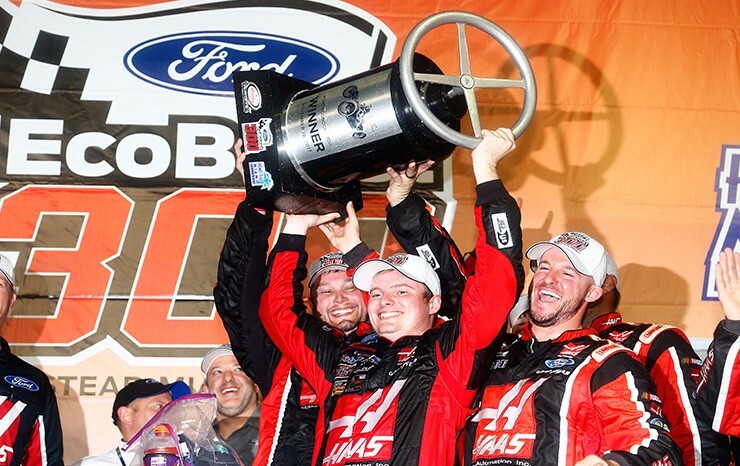 Cole Custer with SHR captured their first career Xfinity race win under the Ford Performance banner at Homestead-Miami. 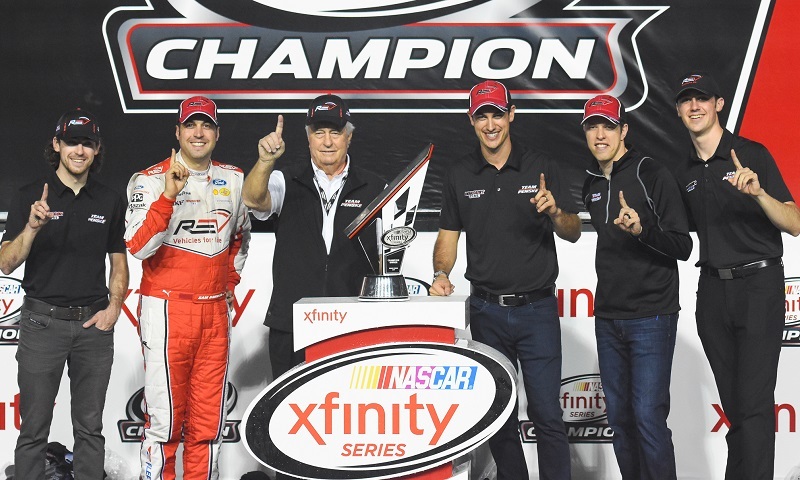 The Xfinity season was capped off with Roger Penske and Team Penske No. 22 Ford Mustang being awarded the Owner’s Championship. The No. 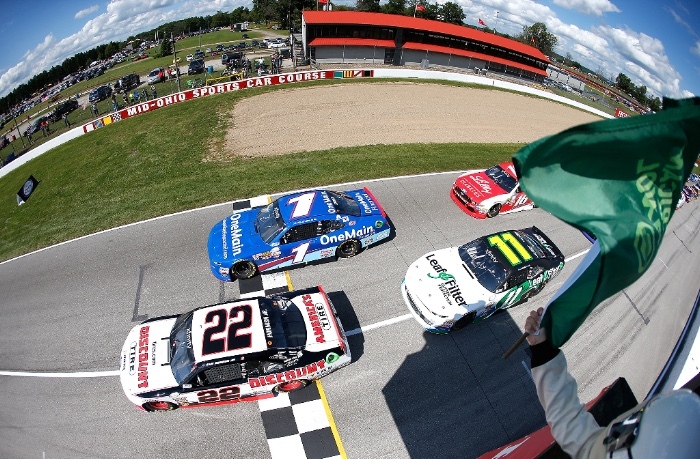 22 recorded four wins and two poles on the season with five different drivers; Ryan Blaney, Sam Hornish Jr., Joey Logano, Brad Keselowski and Austin Cindric. In the final season for Brad Keselowski Racing both the No. 19 driver, Austin Cindric and No. 29 driver, Chase Briscoe showcased their aspiring talent. 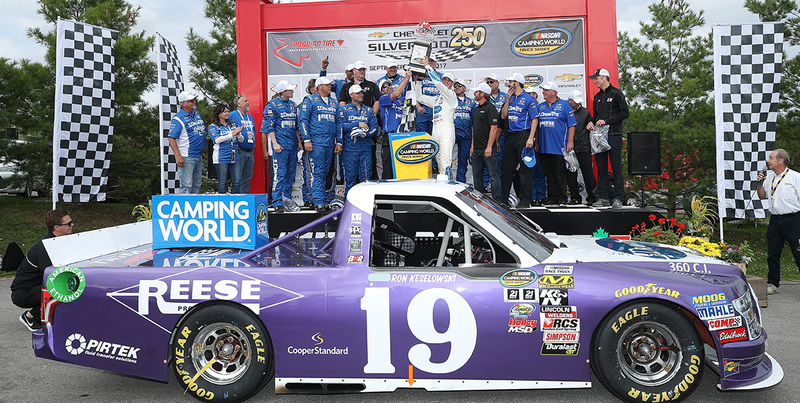 Both drivers won their first NASCAR Camping World Truck Series races and recorded a total of five poles. Both of these drivers will be seen in the 2018 NASCAR Xfinity Series, competing for Roush Fenway Racing. 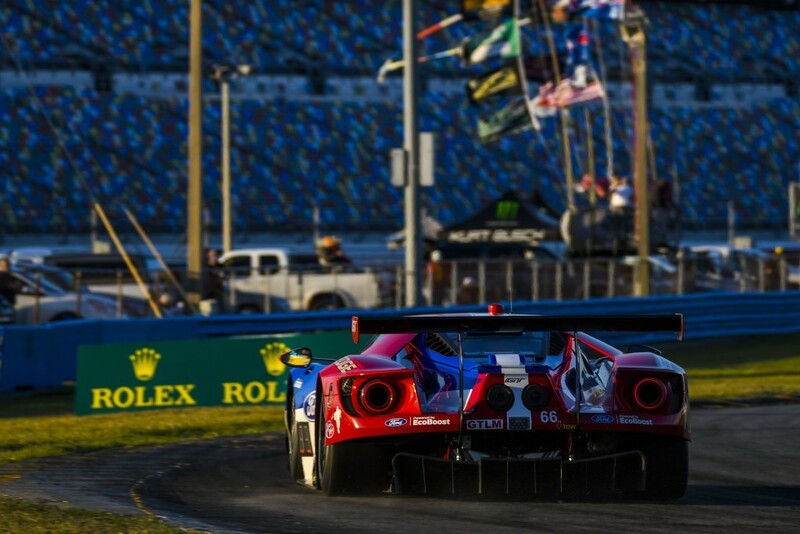 In road racing, the twin-turbo Ford EcoBoost, which powered the Ford GT achieved four wins and six pole positions across the IMSA and FIA Series. 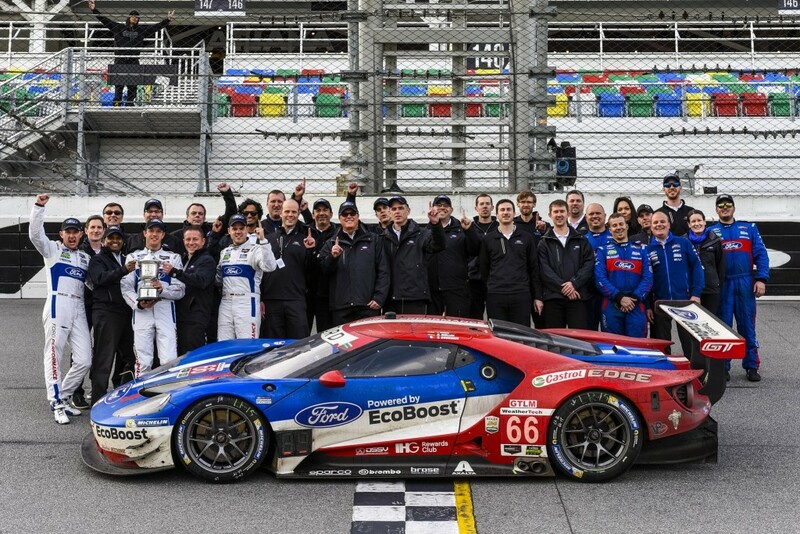 The first of these wins came in IMSA and FIA season openers; the Rolex 24 At Daytona for the Ford Chip Ganassi Racing – US team and Six Hours of Silverstone for the Ford Chip Ganassi Racing – UK team respectively. 2017 also marked the inaugural race year for the Ford Mustang GT4 powered by the Mustang 5.2L V8 race engine in the IMSA Continental Tire SportsCar Challenge Series. 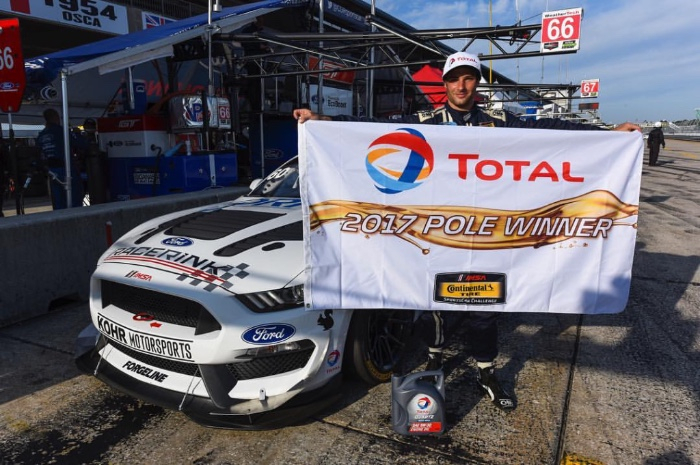 The teams accumulated a total of three poles and three wins on the season and marked the 300th overall win for Roush Yates Engines. 14 CHAMPIONSHIPS – 312 WINS – 282 POLES! Thanks to our premier partners; Ford Performance, Mitsubishi Materials U.S.A., Safety-Kleen, Universal Technical Institute, Cometic Gasket, Clevite, Mitee-Bite Products, Rottler, Mastercam, Converge CFD Software, L.S. Starrett, RKL eSolutions, and TYKMA Electrox. And a special Thank you to our Fans! Thank you for the support and we look forward to seeing you back at the track in 2018. 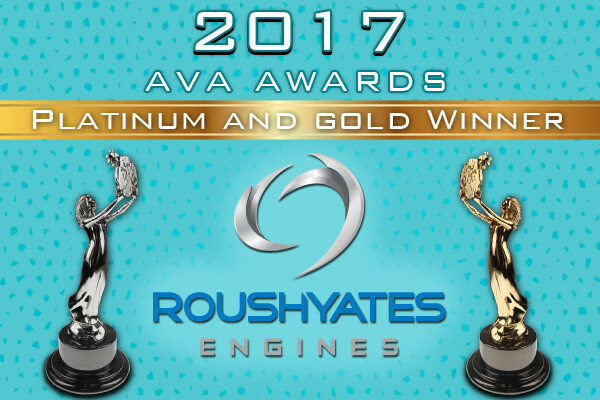 MOORESVILLE, N.C., January 11, 2017 – The prestigious AVA Digital Awards recognized Roush Yates Engines for their outstanding accomplishments in the area of video and web-based production. Roush Yates Engines was presented with a pair of awards highlighting their excellence in marketing and creativity. The team was awarded Platinum in the category of Web-Based Production related to the newly created Roush Yates Engines website, which is focused on building brand, product and partner awareness. 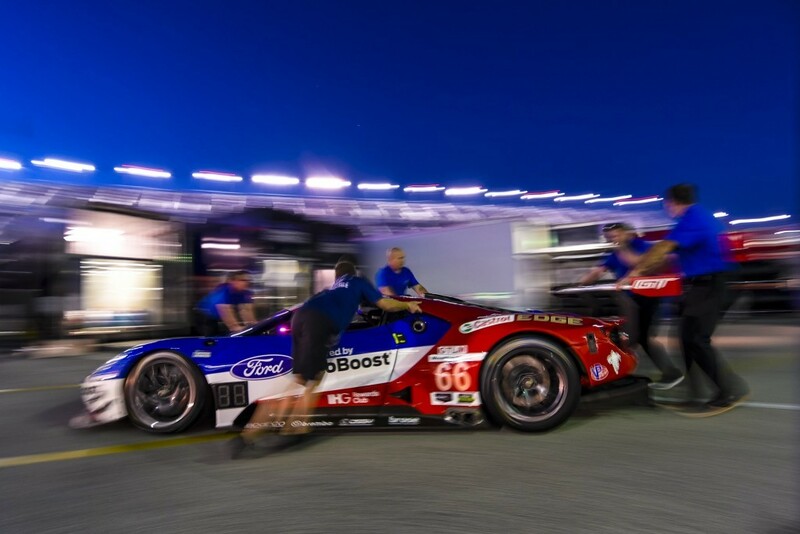 In addition, the organization was awarded a Gold award for outstanding achievement in the category of Video Production, Creativity & Editing for the production of the Building for Le Mans | Roush Yates Engines video. 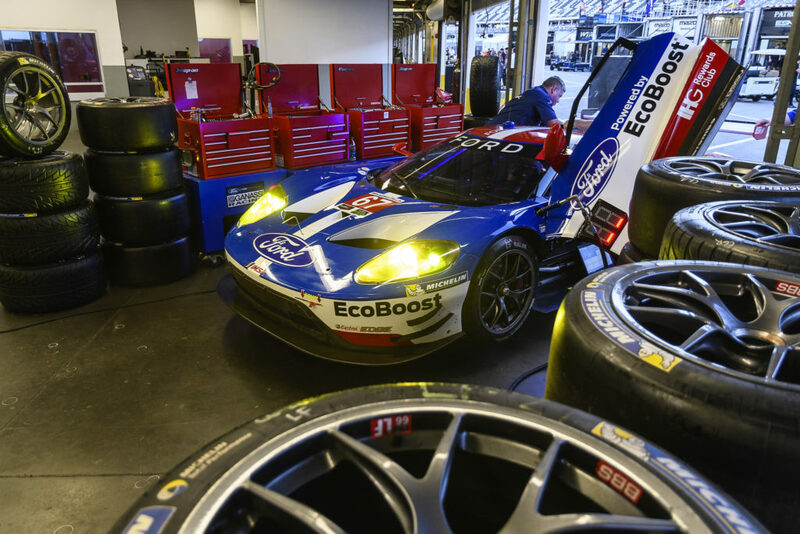 This video celebrated Ford Motor Company’s 50th Anniversary return to the 24 Hours of Le Mans. 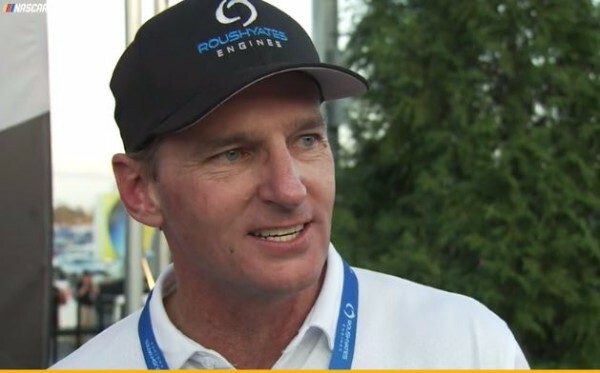 The video inspired the Ford Performance and Roush Yates Engines team on their way to building the 2016 Le Mans winning twin-turbo Ford EcoBoost V6 race engine. Ford Performance Ford GT historic return to Le Mans. AVA Digital Awards is administered and judged by the Association of Marketing and Communication Professionals (AMCP). This international organization rewards outstanding achievement and service to the profession and is set as the benchmark in the industry. AVA Digital Awards is a world-wide competition that recognizes outstanding work by creative professionals involved in the concept, direction, design and production of media that is part of the evolution of digital communication. Roush Yates Engines is a leading edge engine development company, with three state-of-the-art facilities based in Mooresville, NC; which include Roush Yates Engines, Roush Yates Performance Engines Group, focused on road racing and Roush Yates Manufacturing Solutions, a world class manufacturing center. The company’s core business includes designing, building and testing race engines. 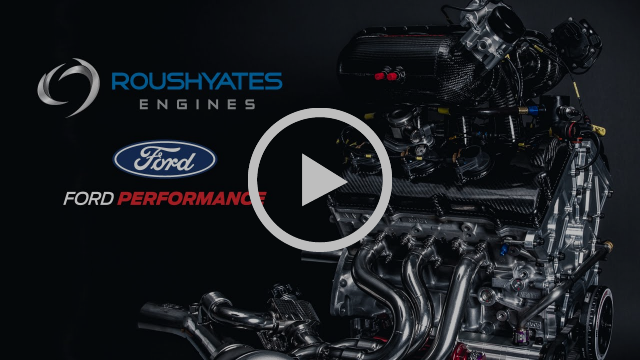 Roush Yates Engines in partnership with Ford Performance is the exclusive engine builder of the NASCAR Ford FR9 V8 engine and twin-turbo Ford EcoBoost V6 race engine that powers the Ford GT supercar. Sebring, Fla. March 20, 2017 – The No. 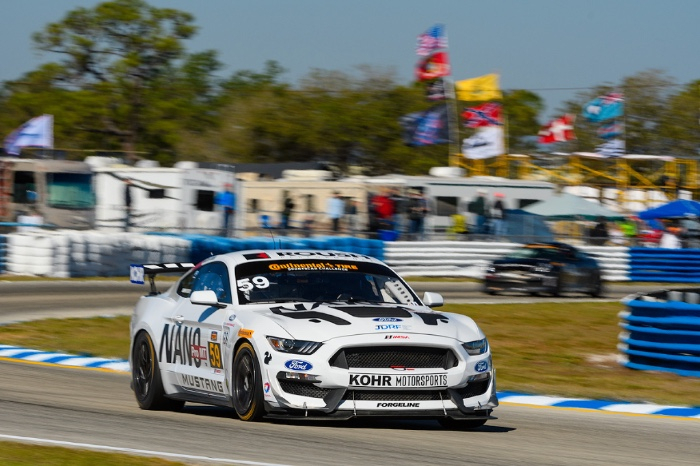 60 Ford Mustang GT4 won its first checkered flag for KohR Motorsport in only its second race in the IMSA Continental Tire SportsCar Challenge Series at Sebring International Raceway. The KohR Motorsports car started from the pole position, after Jade Buford recorded a lap time of 2:11.610 to take the pole on Friday. The No. 59 sister-car of Jack Roush Jr.* and Dean Martin earned a third place qualifying position. After winning the pole, Buford said “Our goal is to lead the race from the start and be leading it at the end.” The No. 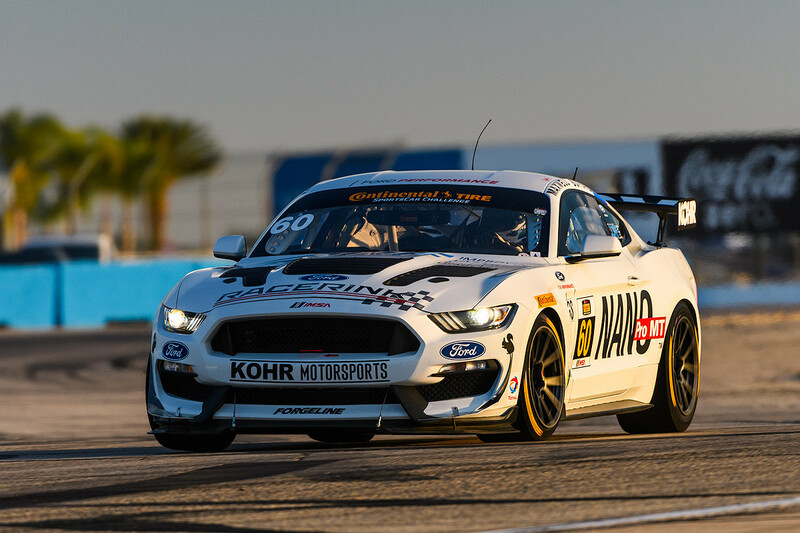 60 won the GS class and overall race to achieve Ford’s 50th Continental Tire SportsCar Challenge win. Buford took the first stint and with just over an hour to go Maxwell jumped in the Ford Mustang GT4 to take over the second stint. A late caution in the race with only 10 minutes, re-stacked the field. At the restart, Maxwell was able to leverage the horsepower of the Mustang 5.2L engine to take over the lead and the checkered flag. 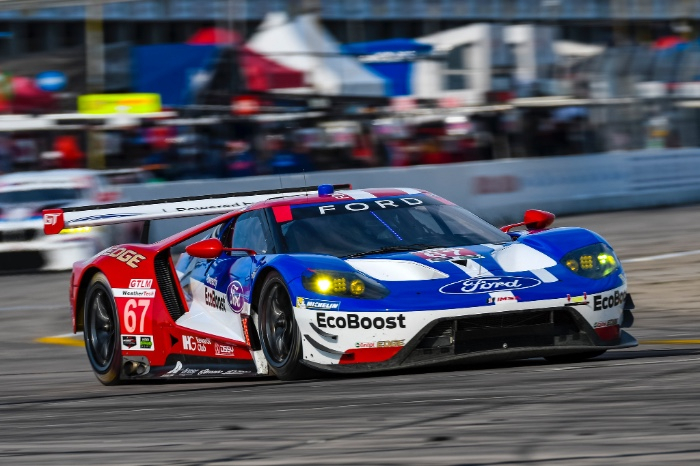 In the IMSA WeatherTech SportsCar Championship Series, the Ford Chip Ganassi Racing (FCGR) team of Ryan Briscoe*/Richard Westbrook/Scott Dixon also won the pole with Briscoe laying down a 1:55.939 lap time in the No. 67, just edging out the No. 66 sister car of Joey Hand*/Dirk Müller/Sébastien Bourdais. 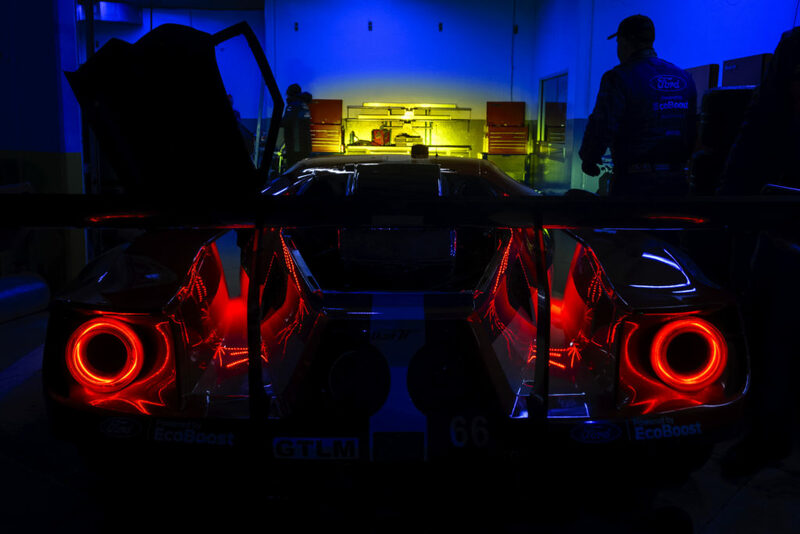 The third Ford GT, from FCGR – UK team of Stefan Mücke*/Olivier Pla/Billy Johnson in the No. 68 started the race in P6. 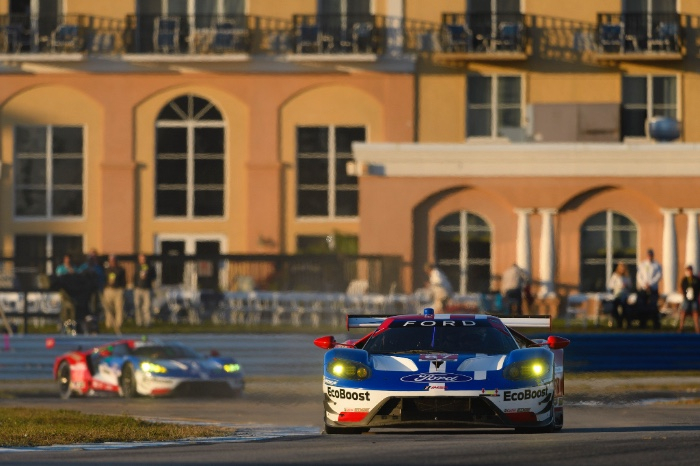 The three Ford GT cars ran strong the entire race, all taking a turn leading the twelve hour endurance race. The No. 66 took a second podium position with teammates in the No. 67 finishing just off the podium in P4 and the No. 68 in P5. 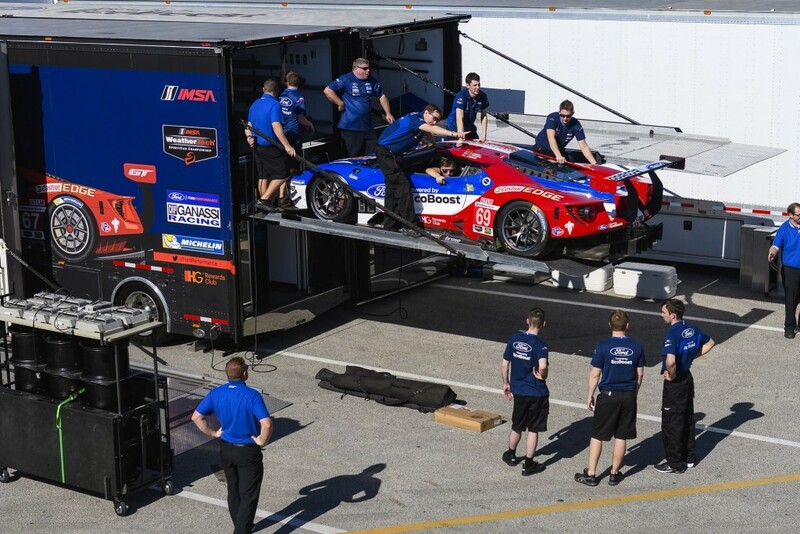 The Fords will take this momentum as the Ford GTs go out west to Long Beach. Tune-in to see all the excitement on the first street circuit of the season, April 8th. Reference the full 2017 schedule on www.roushyates.com. 13 CHAMPIONSHIPS • 290 WINS • 258 POLES! 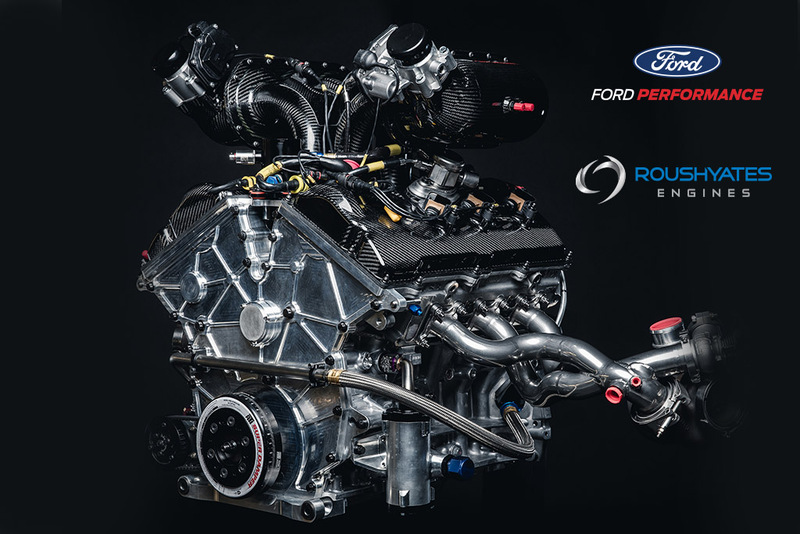 Ford Performance in partnership with Roush Yates Engines is the exclusive engine builder of the NASCAR FR9 Ford V8 engine and twin-turbo EcoBoost Ford V6 race engine that powers the Ford GT super car. 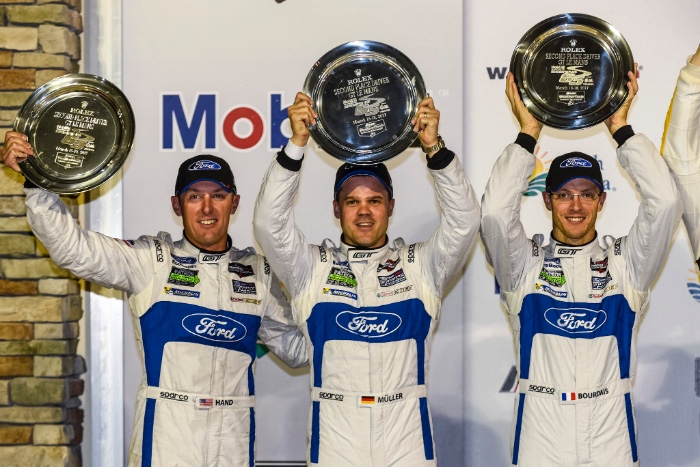 ONE, TWO, THREE FORD SWEEP! 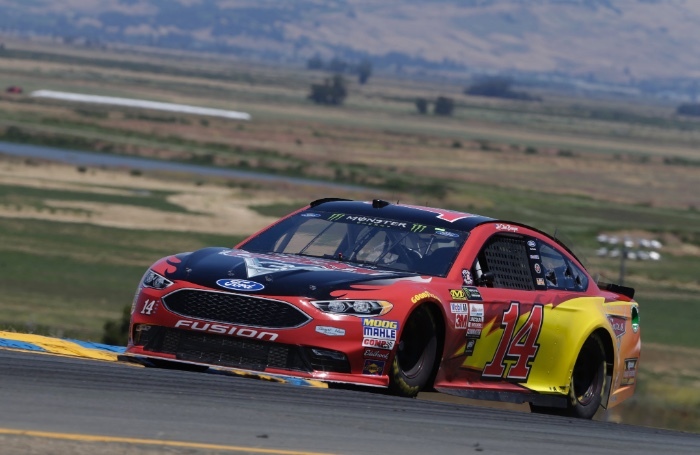 SONOMA, Calif. June 26, 2017 – Kevin Harvick led the way for the Ford Performance trio, including fellow Stewart-Haas Racing teammate No. 14 Clint Bowyer and the No. 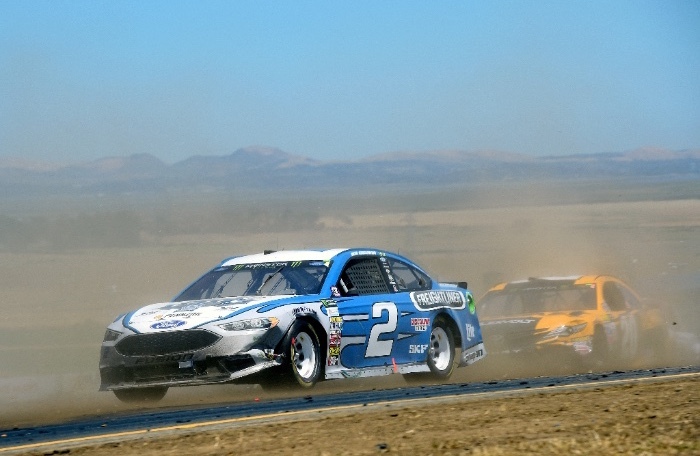 2 Brad Keselowski of Team Penske, to record a one, two, three Ford Fusion finish at Sonoma Raceway. 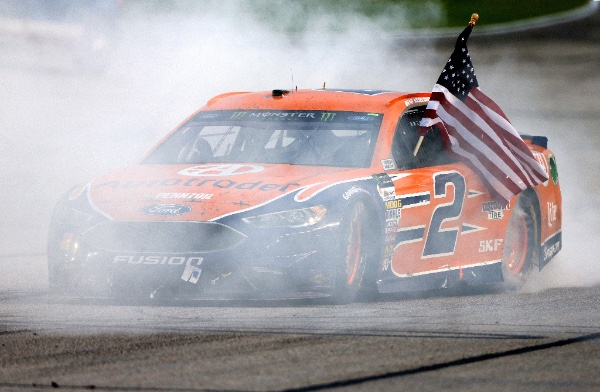 This was the seventh Monster Energy NASCAR Cup Series win for Ford Performance and Roush Yates Engines. 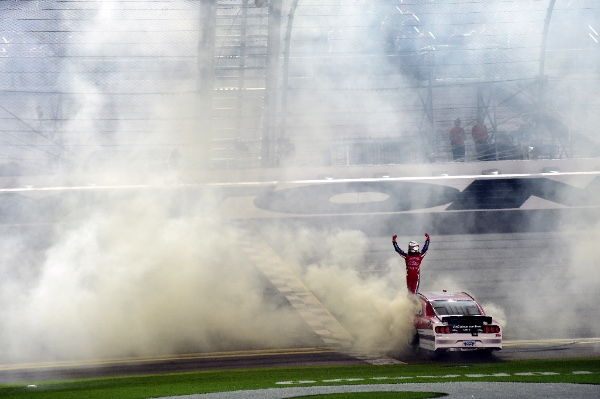 This was Harvick’s first race win of the year and second for Stewart-Haas Racing (SHR). 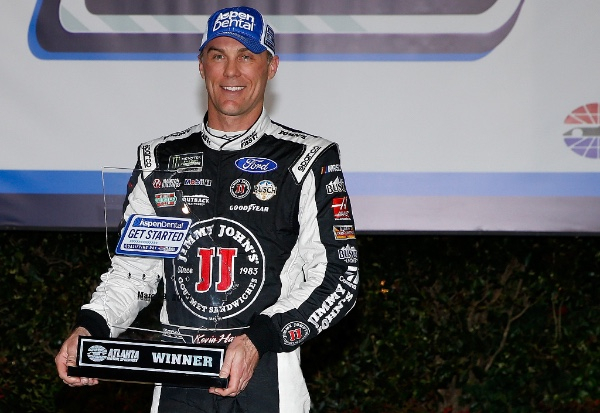 Harvick became the fifth Ford driver to secure a coveted spot in the play-offs, joining Kurt Busch, Keselowski, Ricky Stenhouse Jr., and Ryan Blaney. 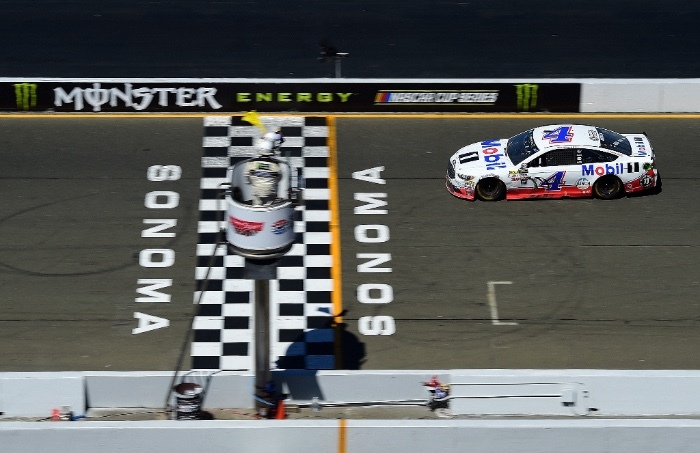 Running a tight fuel and tire strategy, Harvick took the lead in the third and final segment of the Sonoma Save Mart 350 to lead a total of 24 laps and capture the green-white checkered flag. 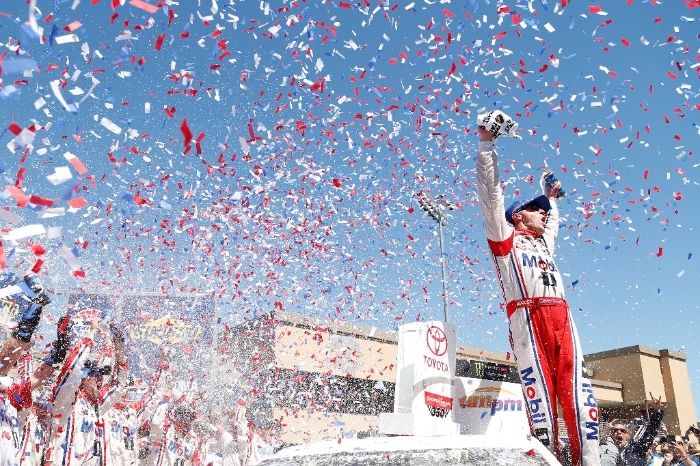 Harvick recorded his 36th Cup win and back-to-back wins for SHR in Sonoma. A hard charging Bowyer, battled all day to drive the No. 14 Ford Fusion up to second and captured his third Top-3 and seventh Top-5 finish of the season. 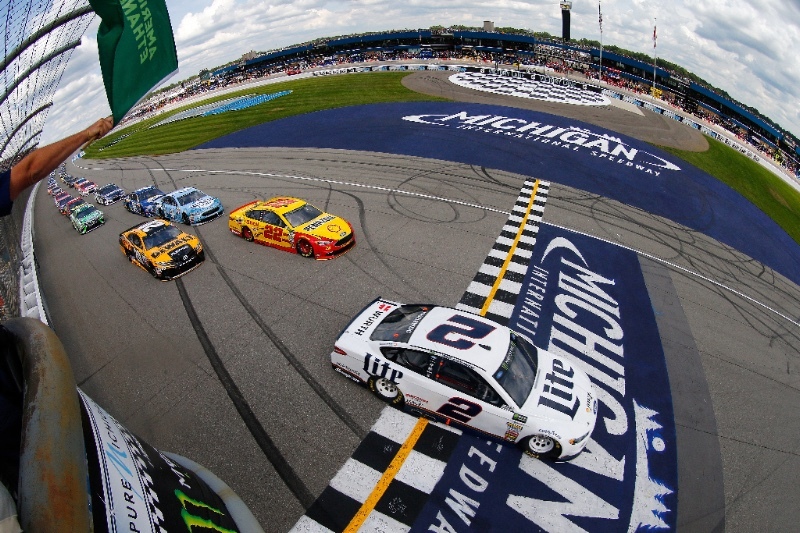 After leading 17 laps in the final segment, Keselowski had to make a final pit stop, turning the lead over to Harvick with 22 laps to go, in order to take four tires, fuel and an air pressure adjustment before driving the No. 2 back up to the front to finish third. Ford Performance had five Ford Fusions finish in the Top-10, representing three different Ford teams; SHR, Team Penske and Wood Brother’s Racing. NASCAR will celebrate the 4th of July at Daytona International Speedway. Reference the full 2017 schedule on www.roushyates.com. 13 CHAMPIONSHIPS – 299 WINS – 267 POLES! 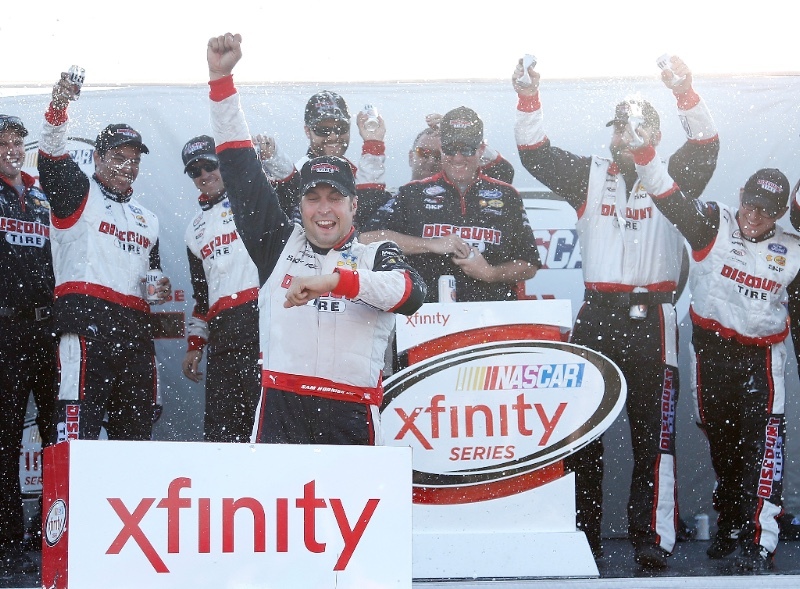 LEXINGTON, Ohio, August 14, 2017 – Sam Hornish Jr., at his hometown track, won his first NASCAR Xfinity Series race this season and fourth Xfinity race for Team Penske at the Mid-Ohio Sports Car Course. 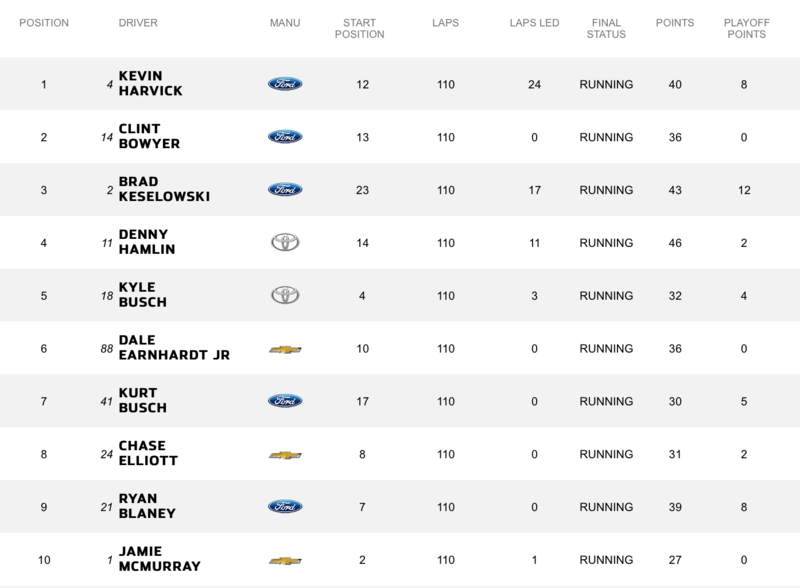 The Ford Fusion drivers currently hold five of the 16 spots, representing four premier Ford Performance teams. 13 CHAMPIONSHIPS – 304 WINS – 272 POLES!